Shortly into Might as Well Be Dead: A Nero Wolfe Mystery, I had a feeling of déjà vu. But this was a world premiere play, how could I have seen it before? Eventually it dawned on me - three years earlier I saw another Nero Wolfe play. The Red Box was the first adaptation of this popular NYC detective series by author Rex Stout, and Might as Well Be Dead is another (a fact that was somehow lost to me before I sat down in the theater). Playwright Joseph Goodrich once again adapted the book into a play, Peter Moore returns to direct on a very similar set designed by Rick Polenek, and several cast members reprise their roles. Hence the feeling of déjà vu. Yes, the story is formulaic, but it's a formula that works. A curmudgeonly yet noble hero detective, his charming sidekick, a series of murders, and suspects a-plenty. If you're a fan of mysteries and noir crime thrillers, this one's for you. Might as Well Be Dead takes place a full twenty years after The Red Box, but not much has changed since then. What I wrote three years ago still holds true: "Nero rarely leaves the house, preferring to spend time with his orchids, his beer, and the delicious gourmet meals prepared by Fritz, his personal chef. Instead, he sends his 'boy Friday' Archie Goodwin out into the world when required... What unfolds is a complicated family drama full of secrets and half-truths. Nero attempts to untangle this mess and get to the truth of the murder(s) by interviewing the parties involved, while Archie dutifully takes notes and adds his two cents. He also works with a police inspector, although it's unclear who's helping whom. It's a suspenseful mystery that will keep you guessing, but the real fun is watching these characters as they navigate the waters of this story." What's different is the ... in the middle. In this case, this mystery involves a woman from St. Paul (I love Minnesota audiences, cheering at the slightest mention of our state) who takes the train to NYC to look for her son. The detectives soon stumble upon the striking coincidence that her son is the same man who's on trial for a murder he didn't commit. Despite the evidence to the contrary (he's having an affair with the dead man's wife and was found standing over him with a gun), Nero believes he's being set up, but by whom is a stickier matter. Friends? Business partners? Strangers? Who knows?! 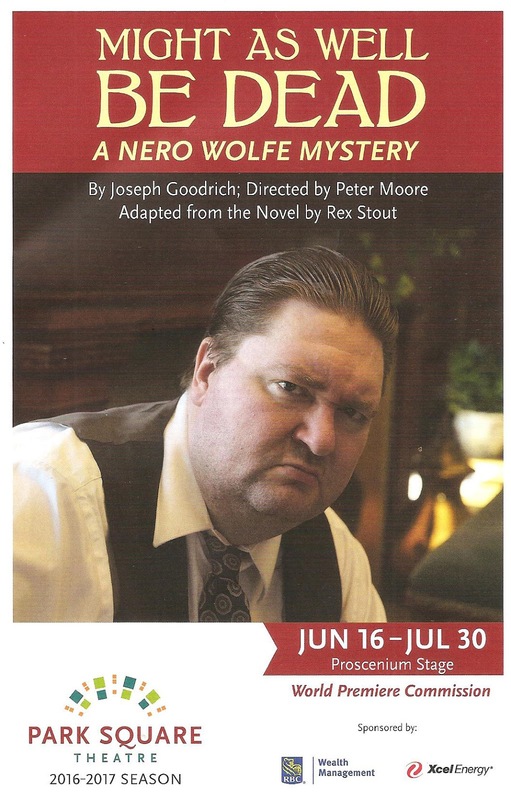 Nero Wolfe does. Or at least he will by the time of the obligatory Big Reveal at the end of the play. The ten-person cast, most of whom play multiple roles, is so much fun to watch. Not wanting to mess with a good thing, Park Square brought E.J. Subkoviak back to sit behind Nero Wolfe's desk and drink his beer. Also returning are Michael Paul Levin as the frazzled detective and Jim Pounds as the charming butler. Ably taking over the role of Archie is Derek Dirlam. The three women in the cast (up from two in the last play), Am'Ber Montgomery, Austene Van, and Marisa B. Tejada, are all wonderful in multiple roles, but the latter is particularly delightful as a beatnik secretary and ditsy society wife. 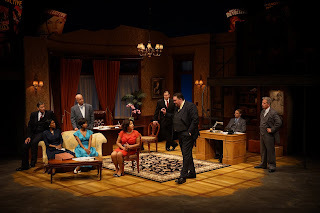 Once again, "the set by Rick Polenek is a beautifully detailed reproduction of Nero's NYC brownstone office, full of fine furniture, books, and artfully placed objects." Director Peter Moore makes good use of this space, which includes a second level. Archie's narrative monologues and some character entrances are made directly to the audience at center stage, which is a fun way to pull the audience into the story. Park Square Theatre is back at the summer mystery game, thanks to The Mystery Writers Producers' Club, a group of donors who help make it happen. They know what works, and Might as Well Be Dead works, thanks to the smart adaptation, consistent direction, and entertaining cast (continuing through July 30, with discount tickets available on Goldstar).